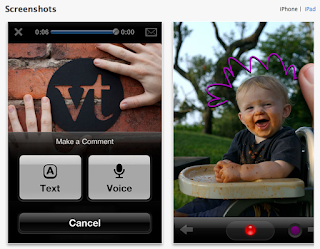 Teaching Without Walls: Life Beyond the Lecture: VoiceThread Mobile Is Here. Over the past two years as my iPhone and, more recently, iPad have crept into my life and begun to play an integral role in the way I learn, communicate, and socialize (not that those three should be exclusive of each other), I have stumbled many times with VoiceThread. VoiceThread's web interface is flash-based and, as many of you know, it doesn't work on an iPhone, iPad, or iPod Touch. I am elated to announce the release of VoiceThread Mobile. The new VoiceThread mobile app is available for free in the Apple App Store. Check it out! Aside from its beautiful design (of which I keep thinking Steve Jobs would approve) the app is exciting because will increase student access to dynamic, participatory learning experiences, making them available to anyone with an Apple iOS device from anywhere at anytime. It also facilitates easy voice (or text) commenting from a mobile device -- oh, and let's not forget the dazzling doodle capability too! Here's the workflow. Download and install the app from the App Store. If you are an existing VoiceThread user, just sign in and all of your VoiceThreads -- any that you have created, shared with you, or to which you have subscribed -- are all instantly at your fingertips! You can open one, listen/read, and comment in voice or text. I have already left voice comments in one of my class VoiceThreads from my iPhone. It's a really cool experience -- especially for edugeeks like me. I haven't shared the app news with my students but one of them has already sent me an email letting me know about the new app! I guess good news travels quickly. You can also create new VoiceThreads using any of the images in your mobile library -- or take a moment to create one on the spot and transform it into a rich, warm, conversation starter. And, as for your students who have an iPhone, iPad, or iPod Touch, they can now participate in the VoiceThreads you create and share with them. How? Well, if you share the VoiceThread with them using VoiceThread's "Groups" feature, then the VoiceThread is automatically there for them after they sign in to the app. My recommendation is to include the embedded version of the VoiceThread (I enlarge the size to 640x480 by manually manipulating the embed code) and a link to the VoiceThread. After the link, make a note that says, "click on this link to open a larger or full-size version of the VoiceThread in a new page or in the free VoiceThread mobile app (for iPhones, iPads, and iPod Touches)." For me, the most exciting part of the app is how I can fold it right into the way I'm already using VoiceThread. In this way, it augments a students' options by increasing their access to our learning activities. I love that. Check it out and let me know what you think...and how you will use it!